Just because the new 911 GT3 has a manual doesn't mean that all future Porsche GT cars will. Purists everywhere must have rejoiced when Porsche revealed the new 911 GT3 at Geneva with an optional manual gearbox transmission. 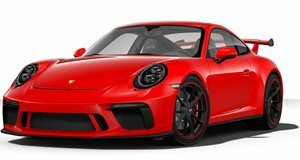 Prior to this, if you wanted a 911 with a manual your best bet was to shell out $1 million for a 911 R. The 911 GT3, in comparison, costs just $143,600. However, before you start thinking that all Porsche GT models will be fitted with a manual, think again. An interview with Road & Track confirms that the next GT3 RS will only come with a PDK dual-clutch automatic transmission. It’s a confusing situation, but according to Andreas Preuninger, head of Porsche GT cars the decision was influenced by the different pools of customers each model attracts. "The [customers] buying an RS are the motorsport guys," he said. They're using the car as a track tool, and then, it doesn't make a lot of sense to have a manual gearbox." For track driving, the PDK provides quicker shifts than a manual, allowing drivers to keep both hands on the wheel to focus on shaving those vital seconds off lap times. Porsche doesn’t think that drivers of the GT3 will have such concerns, and will prefer a driving experience closer to the 911 R than the GT3 RS. Still, at least it shows that Porsche isn’t ignoring purists, which is a very exciting prospect. With its 500-hp, naturally aspirated flat-six engine mated to a manual six-speed transmission, the new 911 GT3 is surely the answer to a lot of people’s prayers.